If there’s one group you want to make sure you don’t disappoint, it’s hard-core fans of college football—especially on Saturdays. But that was a major challenge the Chicago-based Big Ten Network was facing. The network—which is distributed internationally by more than 300 affiliates and broadcasts more than 350 live sports events annually to an estimated 75 million households—needed a better way to organize, reply to and track a flood of email feedback from its viewers. “We were getting a lot of emails from all over with a multitude of questions—programming questions, questions about schedules and just general feedback,” said Mike Vest, media relations manager for the Big Ten Network. On an average football Saturday, Vest said, the network could get as many as 400 emails. All that correspondence would go into a general Gmail account, from which multiple members of the staff might try to reply at once. That system was “wildly inefficient,” Vest said—different staffers’ responses would overlap, and the only record kept was an Excel spreadsheet that didn’t get updated regularly enough. The network simply didn’t have the capacity to deal with the volume of feedback—but needed to be responsive to its viewers, and be able to track their concerns and identify trends. So the Big Ten Network turned to Digital Active for a solution. In response, Digital Active used its ActiveOffice customer relationship management tool to develop a customized, web-based reporting system for the Big Ten Network’s website. Now, instead of emailing their concerns to a general mailbox, viewers now fill out a simple online form that helps the network identify who they are, the region they’re from and what their issue is. The system tracks all interactions between the customer service staff, noting the time and date of each correspondence. To respond to viewers, members of the Big Ten Network’s customer service staff simply check out a ticket (so that other customer service employees know the issue is being addressed) and either reply individually or send alerts to all viewers in a region, depending on the issue at hand. The system’s drop-down menus can be changed quickly to help address any customer-facing events that may come up. If one of the network’s cable providers is having technical difficulties, for example, the Big Ten Network can change the drop-down menus on the contact form to reflect that, proactively communicating issues to customers. The system also features a “Knowledge Base” of templated responses to common customer queries that representatives can use to save time in their communications with customers. 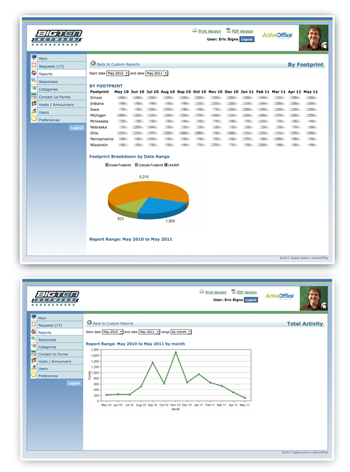 Because the ActiveOffice system collects all vital information about viewers, the Big Ten Network staff can look more broadly at what’s happening in various regions and make decisions about programming, which games should be on which of the networks channels in which regions, what viewers think of on-air talent and other important issues based on viewer feedback. And all of the feedback that the Big Ten Network’s customer service team gets is now regularly reported back to the network’s executive staff. “We can track trends and keep a running tally of what viewers are telling us,” Vest said.